Epic Games revealed the first teaser for Fortnite’s Season 7 in a tweet that previewed the spread of a “bitter ice” and showed what's likely one of the next season's skins. Sharing the tweet below through the official Fortnite Twitter account, Epic Games revealed what appears to be a figure with an icy crown set around a pair of ominous-looking eyes. The tweet marked the start of several teasers that’ll be released before the start of the next season with the message saying there are just a few more days to go before Season 7 begins. The teaser follows Epic Games’ previous trend of teasing the start of the next season during the week that one season will end and the next will begin. More are expected to come as the week goes on until Season 7 officially starts. This first teaser also comes just after a trailer for Season 7 was allegedly leaked, but Epic Games confirmed later on that, just as most of the Fortnite community expected, the trailer was fake, though it was a solid attempt. Themes for Fortnite’s new seasons change each time, but they always give an indication of what to expect from the next season. This first Season 7 trailer is no exception with its icy figure and a hint at more wintery vibes included in the tweet. Speculation about a snow-themed event or map changes have been fueled by datamined files as well as an iceberg that’s floating off the shore of the game’s map. 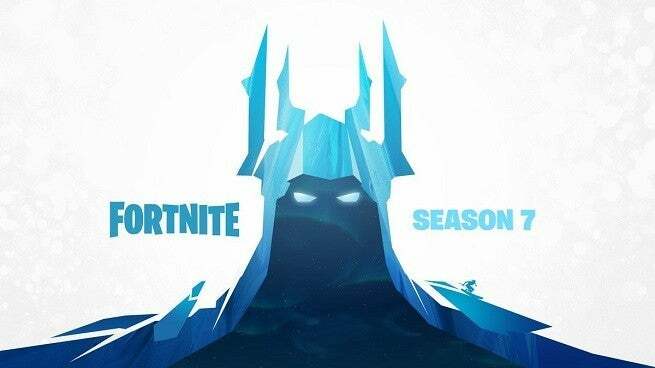 The iceberg has a castle sitting atop it with a snowstorm brewing around it, and it appears to be coming closer to the map’s playable area as the start of Season 7 approaches. Past teasers for incoming seasons have also previewed skins and other features coming to the game at the start of a season, so it’s to be expected that this icy figure will be part of the Battle Pass unlockables somehow or will otherwise be a skin players can purchase. The following teasers throughout the week should reveal more of the same cosmetics and will likely further cement the winter theme. Fortnite’s Season 7 is scheduled to being on December 5th.